If you're one of the 10.9 million Australians who commute to work or full-time study each day, chances are you're already well aware it's really frigging boring not the most exciting way to begin or end your working day. Often considered 'dead time', the average Aussie commute trip time is 53 minutes a day, meaning we spend, on average, close to four and a half hours per five-day week en route to home or work. That's four and a half hours spent either sitting in traffic or squished up against a total stranger on the bus/train/ferry/light rail. Four and a half hours. You could watch 'Titanic' and do a spin class in that time, including a warm-up. But for the 16 percent of us who spend this time on public transport, chances are we're checking a feed, playing a game or watching a series of cat videos. In other words, we spend that time glued to our phone. Think you could put those hours to better use? So do we. How many times have you heard someone say 'I love reading, I just don't have the time'? Ding ding ding! If you catch public transport to work, this could be your chance. Not only will you have the opportunity to feed your inner word nerd, but science tells us there are loads of ways reading can actually boost your mind and well-being. Some of these include increasing your intelligence, boosting empathy levels, helping to keep your brain sharp in old age and even assisting you in getting a better night's sleep. And if that's not enough to get you hot-footing it to the nearest library, if there's one thing we've learned from the Instagram account 'Hot Dudes Reading', it's that there's nothing sexier than a babe with a book. Don't freak out. No one is asking you to BYO incense and start 'ohm-ing' it up on the 7.31 to Parramatta. But with so many proven neurological benefits to daily meditation (including reducing depression, anxiety, and, importantly for many full-time workers, stress levels) it seems silly to let these stretches of largely uninterrupted time go to waste. Check out these commute-friendly mindfulness techniques to get you started. Again, we're going to have to ask you to refrain from jumping to conclusions with this one. Knitting may have a 'but that's something my grandma does' reputation, but there are actually loads of celebrities who swear by the hobby, as well as evidence to suggest it reduces stress. Even better, you actually get a tangible, often-wearable result at the end of it, which will no doubt make you especially popular in winter when scarves, beanies and gloves become particularly hot property. Julia Roberts is said to be a keen knitter. Okay, so you're allowed to use your phone with this one, because nobody wants to miss their stop and be late for work. If you have a long-ish commute, set your alarm to 20 or 30 minutes and use this time for a quick cat-nap. According to the National Sleep Foundation, "this type of nap provides significant benefit for improved alertness and performance without leaving you feeling groggy or interfering with nighttime sleep." Plus, who knows, it might make getting out of bed that little bit easier. 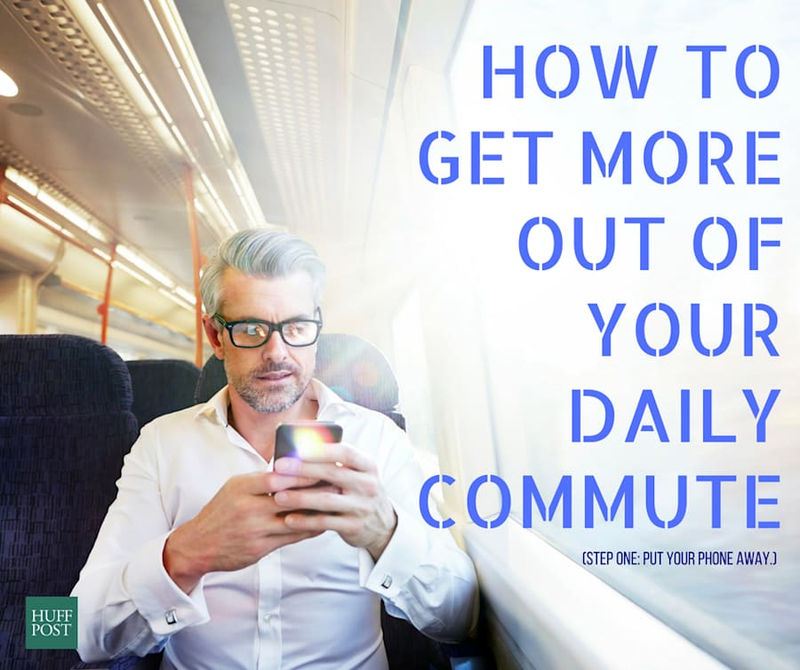 If you're keen to tackle the day head-on, instead of using your commute to trawl through your work emails, take the time instead to plan ahead and organise your day. If you have a big meeting coming up, pack a notepad in your briefcase/handbag and jot down any ideas or new thoughts you might want to discuss, or goals you want to achieve that day. For the ride home, you could take the time to chronicle what was accomplished that day, what could have been done better and/or make a list of things to get done tomorrow.